As you all know, everyone's skincare routine includes face oils and/or serums. I mean such is the versatility and variety of facial oils, that there is something for every skin type. 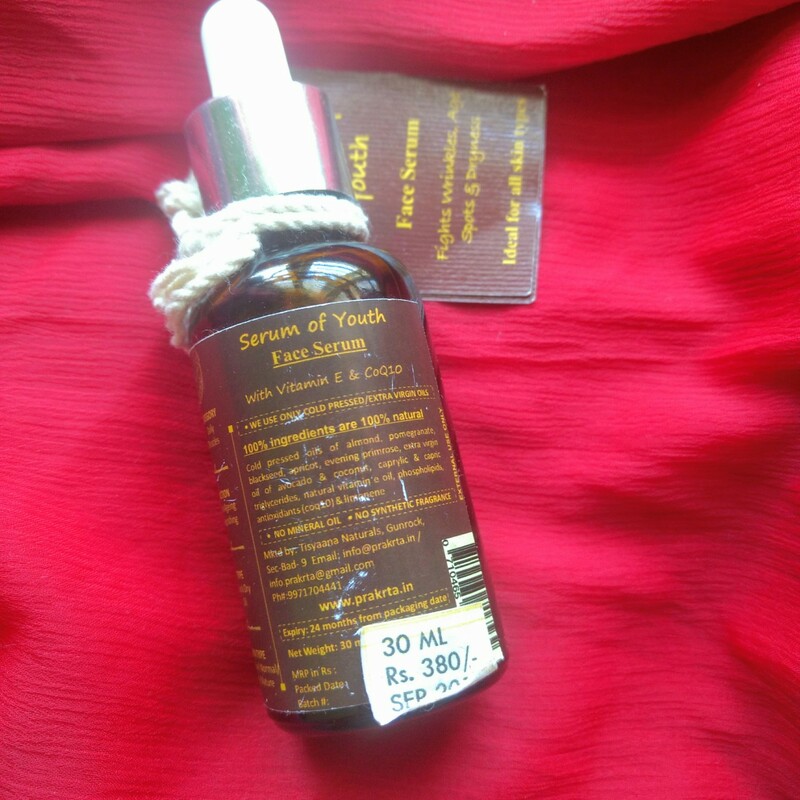 Coming to today's review, we will be checking out how Prakrta Serum Of Youth Face Serum is and whether it's value for money product or not. I have used Prakrta Serum Of Youth in the initial weeks of November before going on a vacation. During my vacation I fractured my leg and now after coming back to Bangalore am again using Prakrta Serum Of Youth Face Serum. My review is based on my initial as well as current usage of the serum. Brand Claims - An all natural serum that can help prevent fine lines and wrinkles, give a smooth, even skin tone and suppleness. 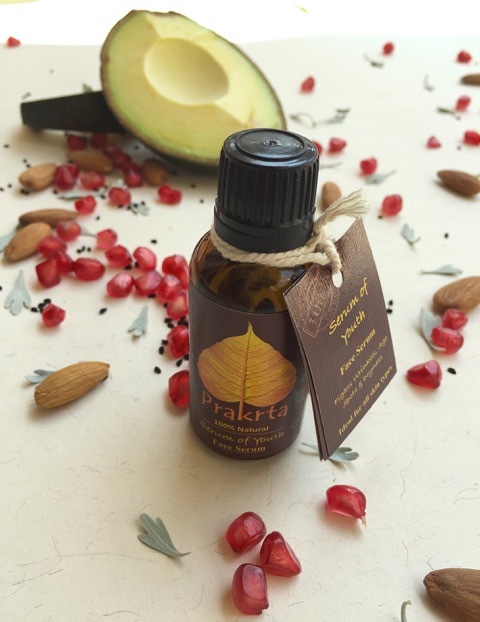 A potent blend of cold-pressed oils naturally high in Vitamin E, A and anti-oxidants for a nourished glowing skin. Enriched with natural vitamin E and CoQ10 which are super anti-oxidants for skin. A Light quick absorbing, non greasy oil for face with natural herbal smell of the cold pressed oils used (no added perfume). We do not add or recommend essential oils or fragrances to face products. Facial skin is 5 times more sensitive than our body skin and any fragrance or essential oil over time will increase the sensitivity of skin. (for some people it will happen late but for sensitive skin they may react to added fragrance more quickly) Many essential oils etc make skin sensitive to sun (photosensitivity) and eventually sun sensitivity can lead to pigmentation. Use as a daily moisturiser. Massage 5-7 drops of this precious oil on clean damp skin, in upward circular motion. Since there is no added fragrance it can be used as a day serum or in the night before sleep. If you have normal to oily skin then, any excess oil can be just rinsed off the face, lightly, with just water, 10 minutes after applying. The Face Serum is packed in a dark glass bottle with a plastic stop and black cap. Additionally a glass dropper is also provided for ease of use. I particularly like using dropper for dispensing the oil, as it prevents product wastage and spillage also. Talking about the fragrance and texture of the oil, fragrance is very herbal and non lingering. The fragrance fades away immediately once we apply the oil and sometimes I love sniffing the fragrance. The texture of the oil is very light, non greasy. The oil is not at all heavy and gets absorbed quickly into the skin once you apply it. 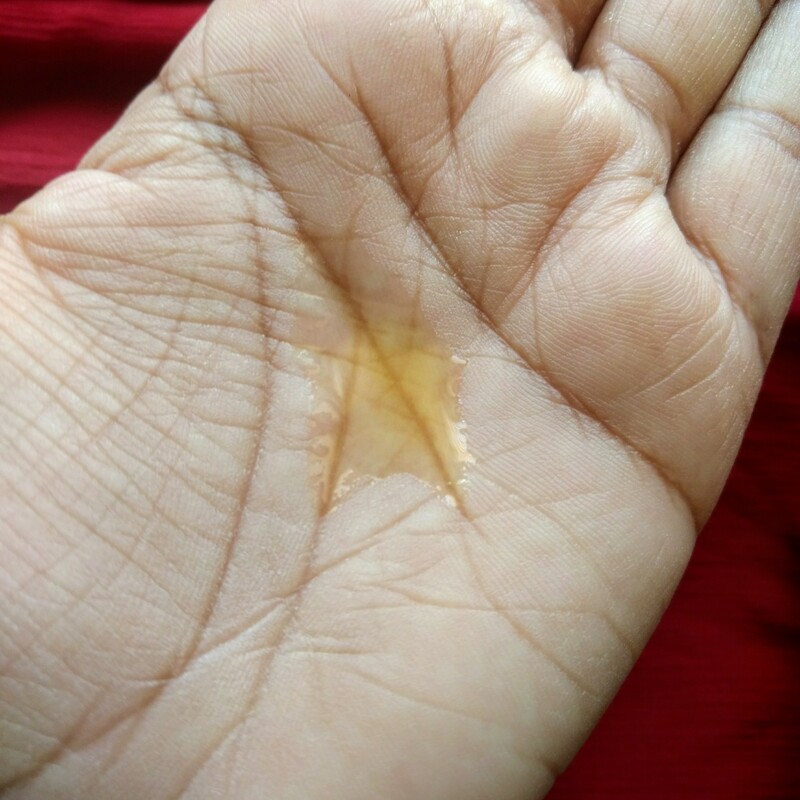 My favourite way of application is first warming up the oil on my palms and then applying. Sometimes I have applied this oil in excess to my face and still it didn't leave an oily sheen on my face. The oil has never broke me out and I have used the oil day and night into my skincare routine. The results of Prakrta Serum Of Youth Face Serum, are very good and have taken me by surprise. I usually never expect a product to work immediately once I inculcate into my routine, but this oil has shown good effects within one week. It not only smoothens the skin and makes it soft but also adds a healthy glow to the skin. After applying it during day time my skin became soft and smooth. 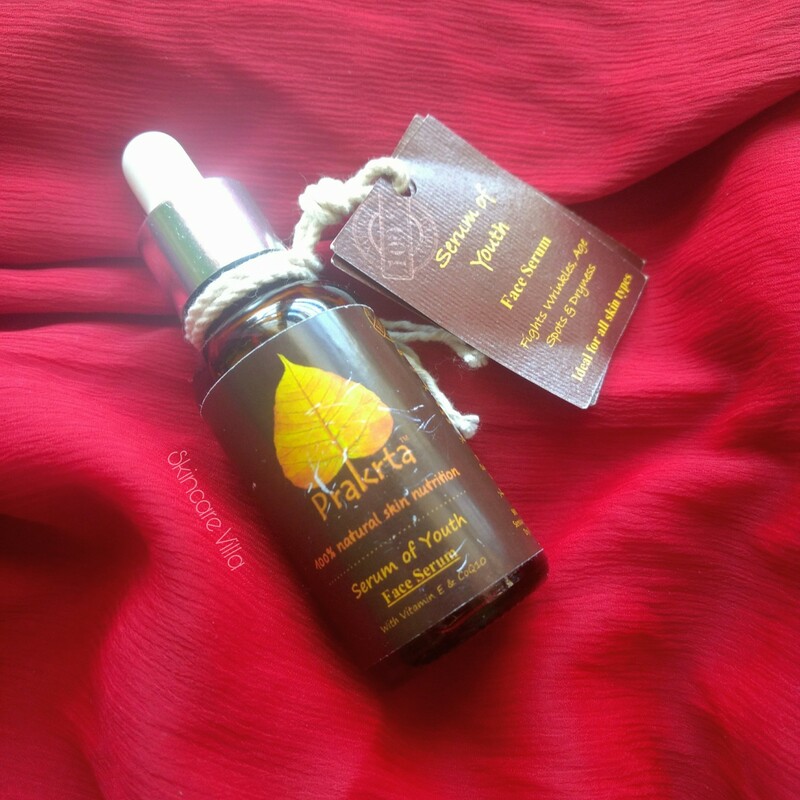 But after applying it at night, I noticed a healthy glow and brightening of my skin. It is due to the antioxidants and brightening ingredients that Prakrta Serum Of Youth Face Serum contains. My pores have reduced and the skin on my cheeks has evened out a bit after inculcating the serum again into my routine. Overall the product is a good for people with all skin types who are looking for a option to add glow to their skin. I sometimes feel we just need to find some skincare gems like these to include into our skincare routine. Price, Shelf life and Availability - 380 INR for 30 ml with a shelf life of two years. Available on Amazon.in and website of Prakrta. I would highly recommend using Prakrta Serum Of Youth Face Serum for it's effectiveness as well as affordability. The product contains antioxidants which help in bringing a glow to the skin while making the skin soft and smooth. What more can we ask at this price point of the product? 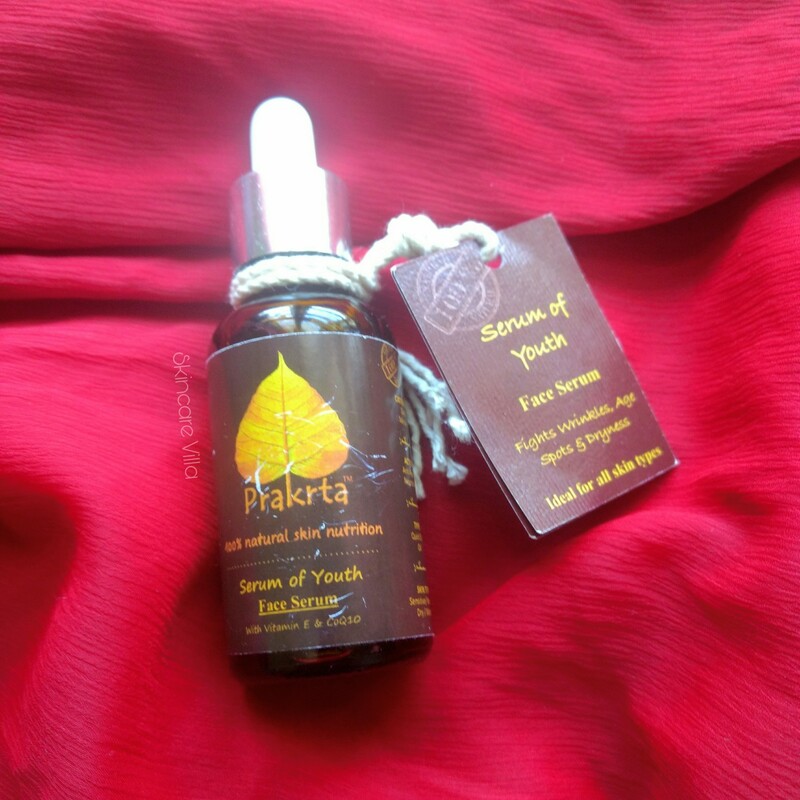 I am already eyeing another bottle of Prakrta Serum Of Youth Face Serum. The product is packed in a square shaped plastic bottle with a metallic screw cap and a plastic stopper. The usage of such bottle is a bit difficult, but I made a small piercing in the stopper to dispense the oil. Nonetheless the package light, travel friendly and non leaking. 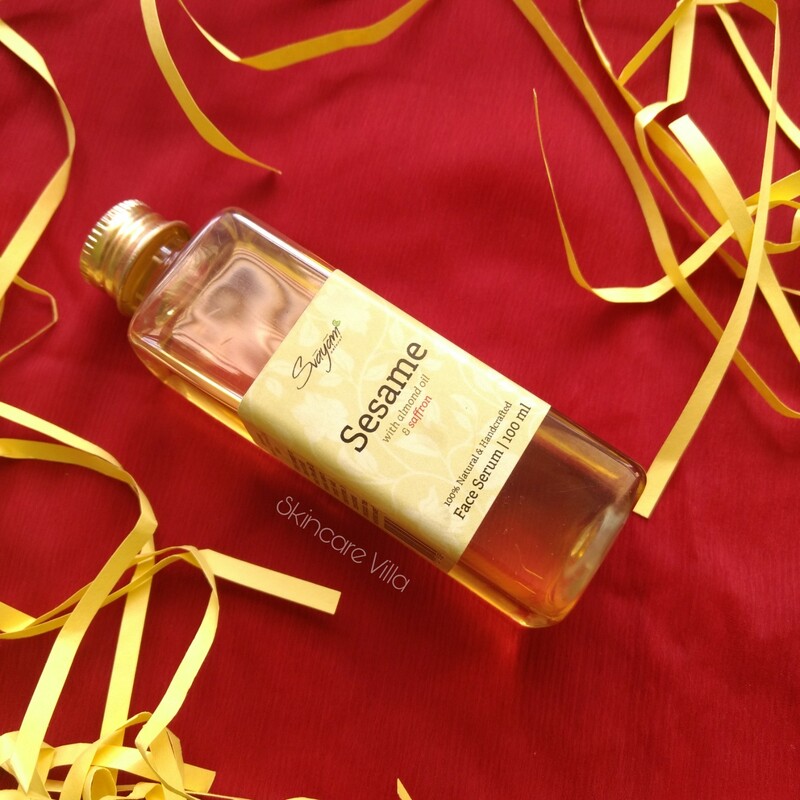 The Sesame serum is a thick oil, with an earthy fragrance. No wonder it's thick due to its major ingredient Sesame oil. I quite like the fragrance which fades away immediately once the oil gets absorbed into the skin. I like sniffing the fragrance, it's like cold shower on a hot sand 😍. 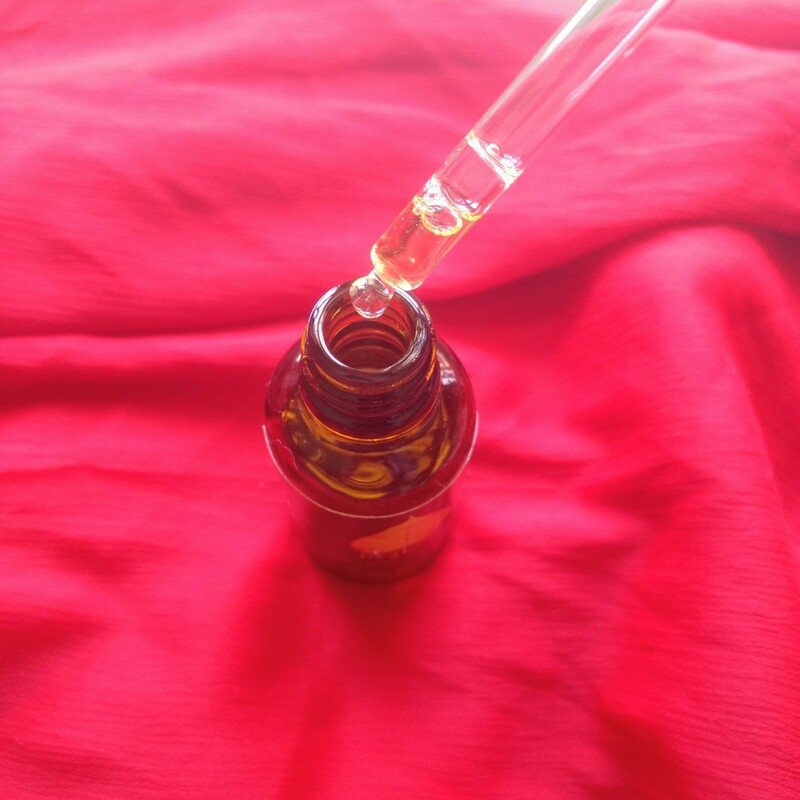 The oil looks yellowish in the bottle, but it has a very faint yellow tint once you dispense a small quantity. Now coming to the effects, I am surprised and super impressed with the results of this serum and the credit goes to the ingredients in the serum. 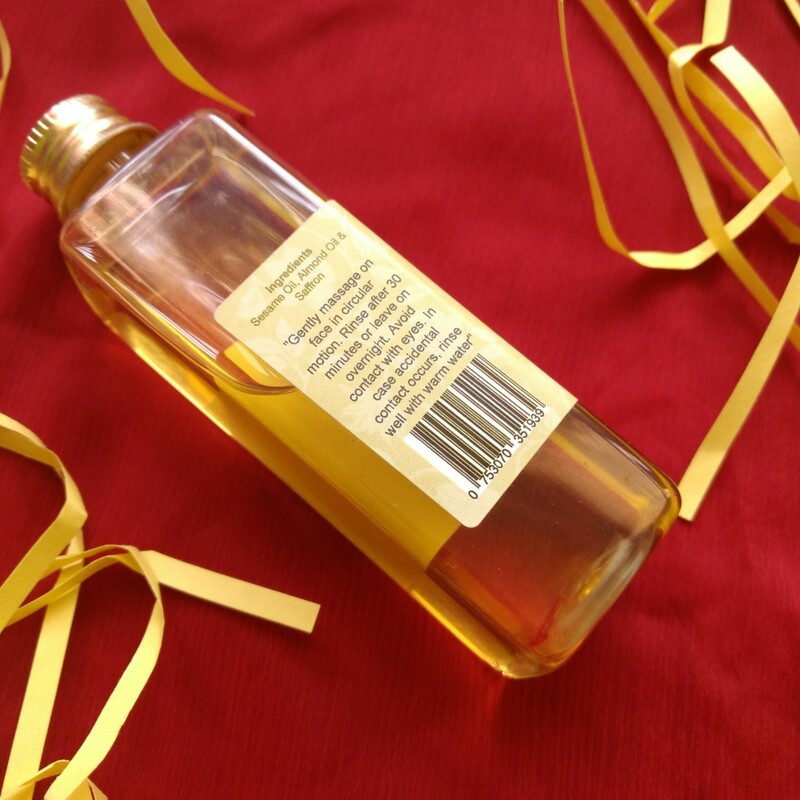 We all are aware of the benefits of Almond oil as well as Saffron for skin. 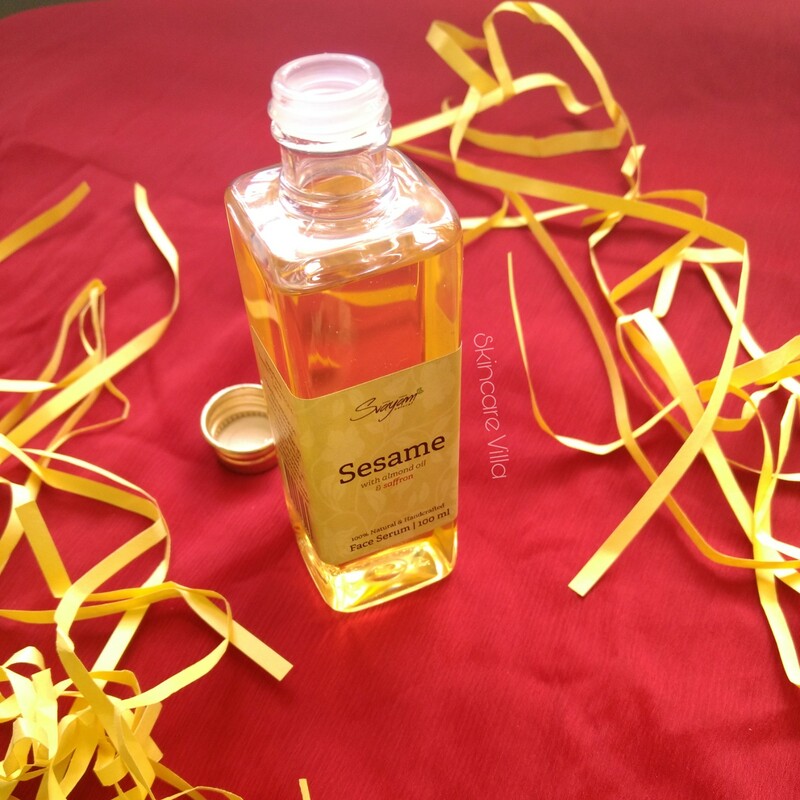 What is unexplored is benefits of Sesame oil. I have used the Sesame Serum for almost 3 weeks at a stretch to test it's efficiency. The oil being thick, I thought would be heavy for my oily acne prone skin, I was wrong! Initially it feels like we have applied a heavy oil, but it gets absorbed fully after 4-5 minutes. I have used the Sesame serum exactly as mentioned by the brand, leaving it overnight and sometimes using it day time after leaving it on for 30 minutes. The Sesame serum has reduced my fresh acne marks while also reducing pigmentation under my lower lip. Also with the regular usage of this serum, I experienced almost zero breakouts this month. If you know my skin, I get hormonal acne every month. Also it has reduced the size of one big hormonal acne, with regular night time massage. However I haven't noticed any changes in the laugh lines and it works slowly on the old acne marks. After using it overnight, skin feels plumped up and soft as baby skin in the morning. 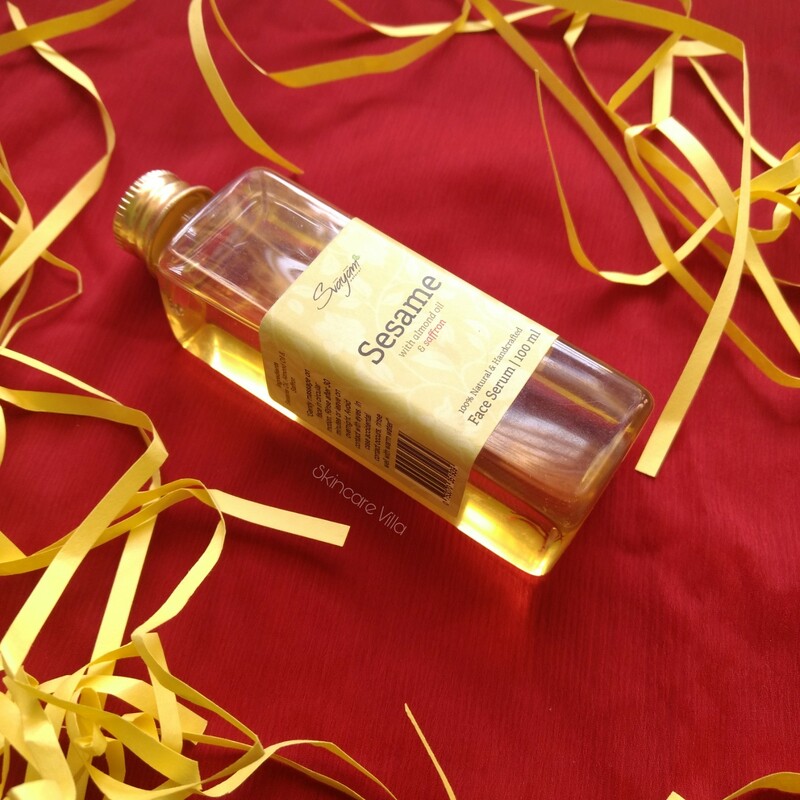 During day time it makes the skin soft, but leaving it overnight is my preferred way of using the oil. Sometimes I used to massage a lot of oil into the skin, still it didn't make my skin oily or didn't cause any breakouts. I am happy with the results I have got with the Sesame Serum and would highly the product to those who are looking for an affordable serum. 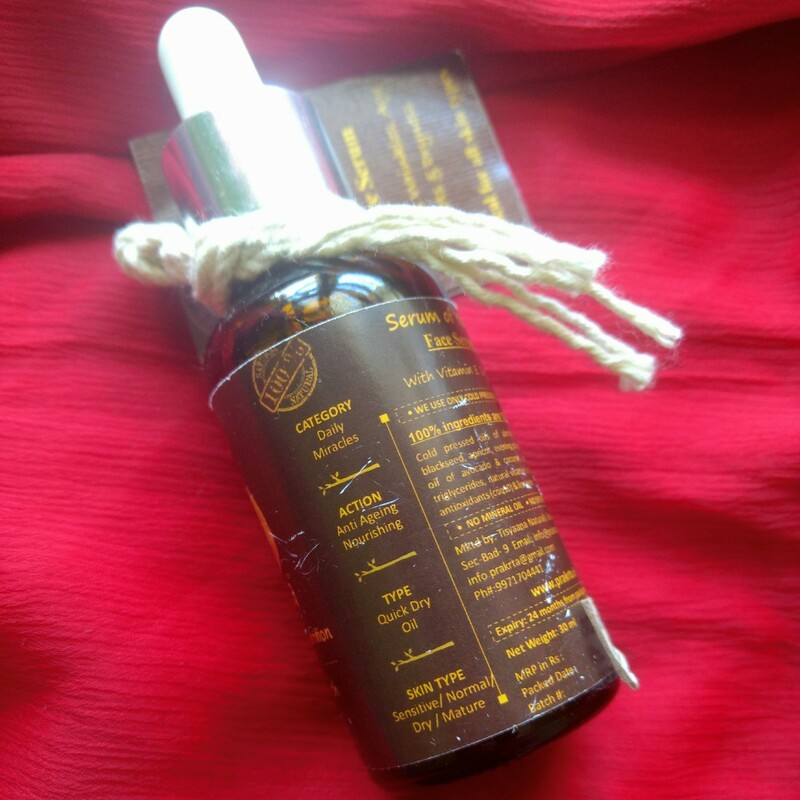 I am super happy with the Svayam Natural Sesame Serum as it's a result driven product. It not only is a multi tasker product but also an affordable one. I will love purchasing this one next time and would highly recommend you all to give it a try and reap the benefits of the ingredients in the Serum. February, the month of Love. For me this month was like usual months and am not so excited about the New Year too. 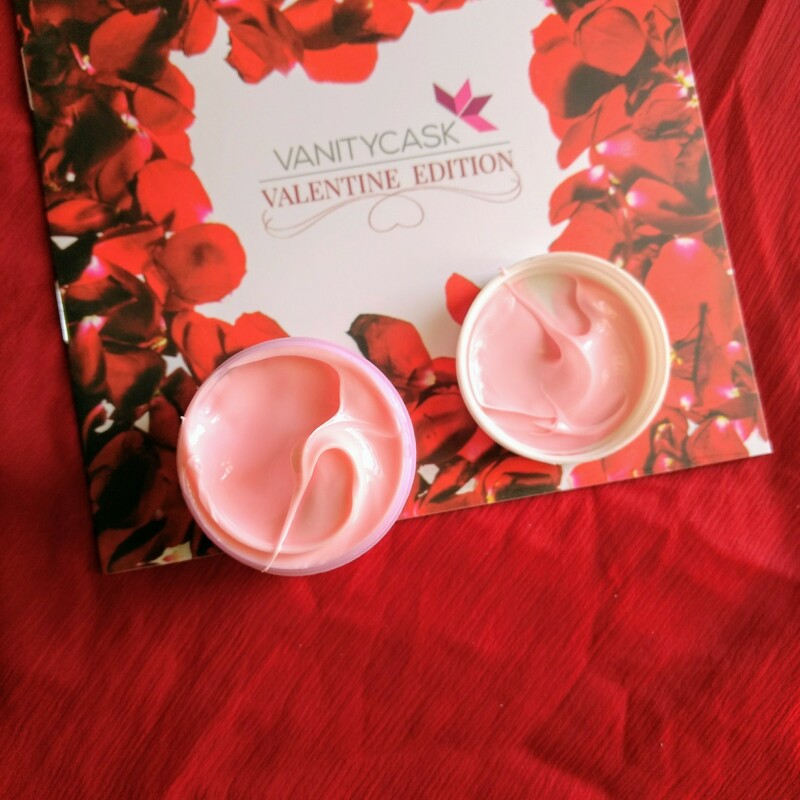 So today we will be talking about the Vanity Valentine Edition of VanityCask Box. 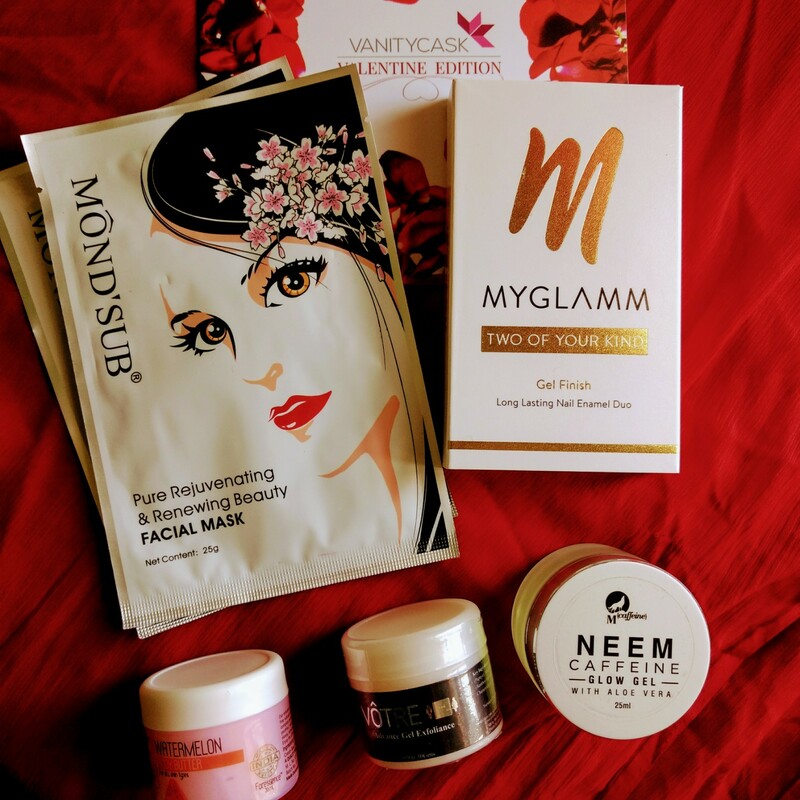 As you all know VanityCask is a monthly subscription box which brings the luxurious brands at affordable prices to you at your doorstep every month. In the past boxes we have received products from Thalgo, Gulnare, Votre etc whihc otherwise are very costly yet effective. So let's head straight to the box and see what all we have received. I am super happy with the things I have received and let me explain you why. And yes I miss Gulnare this month. 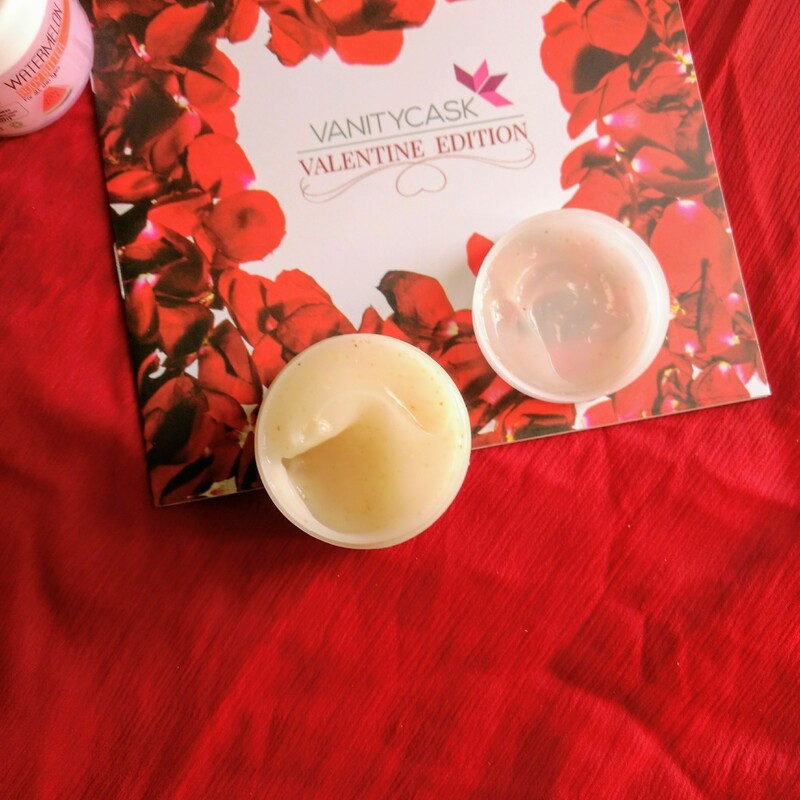 This Valentine's day spend some time with yourself, indulge in giving your body the care and love it deserves with your Vanity Valentine Edition! In your hands, is the perfect kit for a weekend pamper session at home. 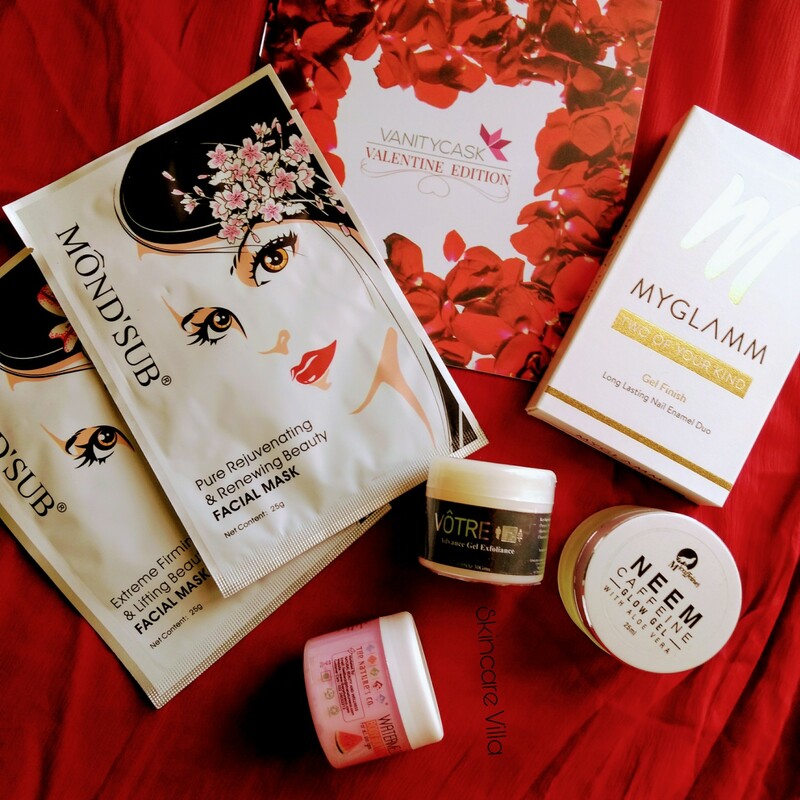 With the perfect body butter, face gel, sheet masks, assorted skincare and Haircare products and nail polishes, your box is the complete solution for your body. All our products are meant to refresh you and leave you with soft and beautiful skin and hair. Show me a girl who hates nail polish!! I have received the Summer Souffle duo which has Saffron, a bright reddish orange and Peaches and Cream, a soft peach shade. There are 4 options as put of which we receive one duo. I am happy with the shades I have received as one is light and other one is dark keeping room for nail art experiments. Brand claims - Ultra shiny, long wearing and sensational shades that team up together for a true colour or playful nail art. Gel effect polish glides on effortlessly and easy application. Highly pigmented to provide exceptional coverage and with a plumping agent to level out any imperfections on the nail. 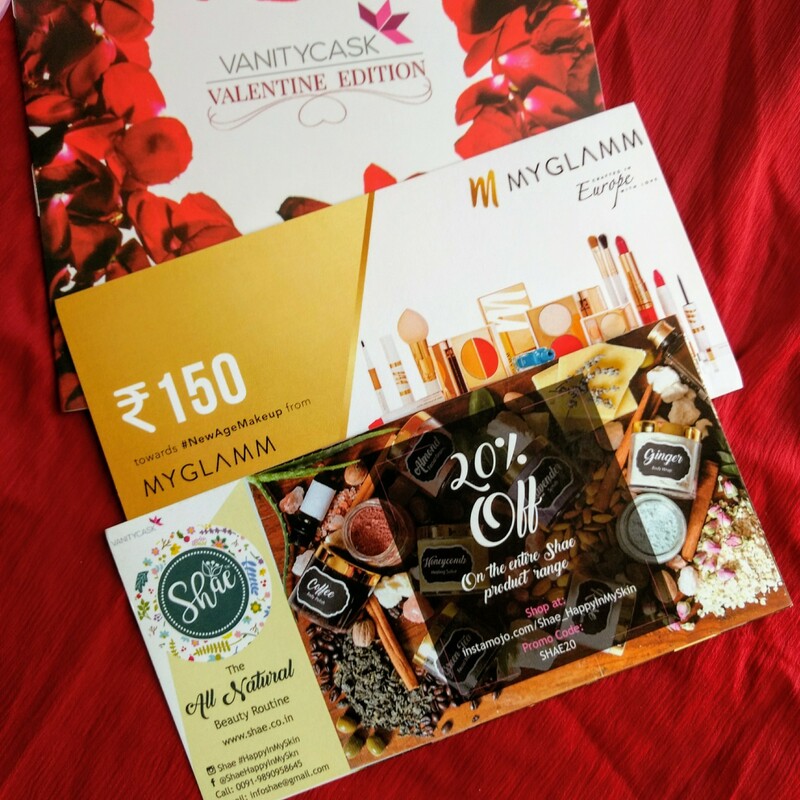 We have a voucher for shopping with Myglamm. We have received two Mond'sub masks viz. Pure Rejuvenating and Renewing Beauty Mask and Extreme Firming & Lifting Beauty Facial Mask. I ahve high hopes from both the masks and was eyeing this particular brand from a long time. I will be posting a detailed review on this one. 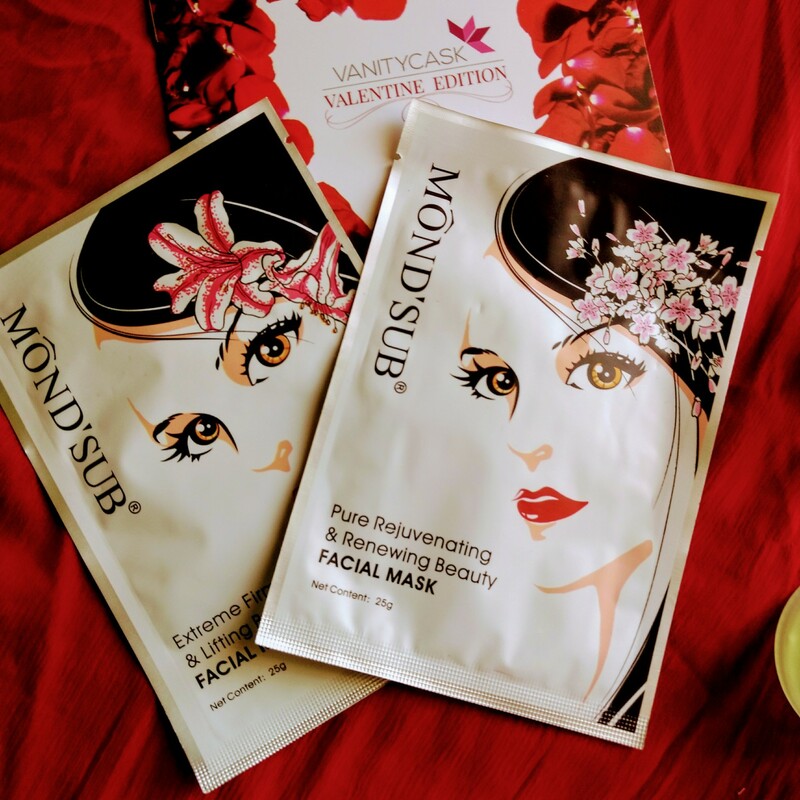 Also, VanityCask Subscribers get 50% off discount on entire order on www.mondsub.in and validity is till March 31, 2018. How cool is that! Ahhh, now this is something interesting. To be frank I have never liked any product form this brand in previous boxes, but this has got me curious and excited. I will be using this one soon and posting a review. Brand claims - A unique Aloe Vera gel based formula to help your skin glow naturally. Hydrates your skin naturally while nourishing it with nutrients. Neem has anti microbial properties. Add to it vitamin C and E, your skin will thank you with a glow while caffeine tones it. Key ingredients - Neem, Argan Oil, Vitamin E, Cucumber, Caffeine, Glycerine, Aloe Vera. VanityCask Subscribers can avail 15% discount on Mcaffine products till March 31, 2018. I am going to eat this before applying it 😀😂😂😋😋. Tell me from the pictures it isn't looking yummy at all!!???. I am glad I received TNC body butter as they are intensively hydrating and moisturising. Also a little quantity goes a long, also keeping in mind the full size product price and happy with this. But I hate the cream base word in ingredients list 😑. Brand claims - Watermelon Body Butter is rich in Vitamin C,A and fill log free radicals which helps in reducing the aging prolong with its high level of fibres, provides complete moisturization and hydration. Key ingredients - Watermelon extracts, Kokkum Butter, Grapeseed oil, vegetable glycerin, cream base. VanityCask Subscribers can avail 399 INR discount on TNC products on cart value of 1499 till April 30, 2018. This month we have received Advance Gel Exfoliance which is a nice scrub. I don't know whether all boxes gave sane product or different. I have already received this product previously and would have loved receiving some haircare from Votre. Brand Claims - This is a unique formula that brightens up lackluster skin. It is fortified with effective granules that gently exfoliate dead skin cells and blackheads while natural antioxidants help stimulate cell renewal, giving you soft and younger looking skin. 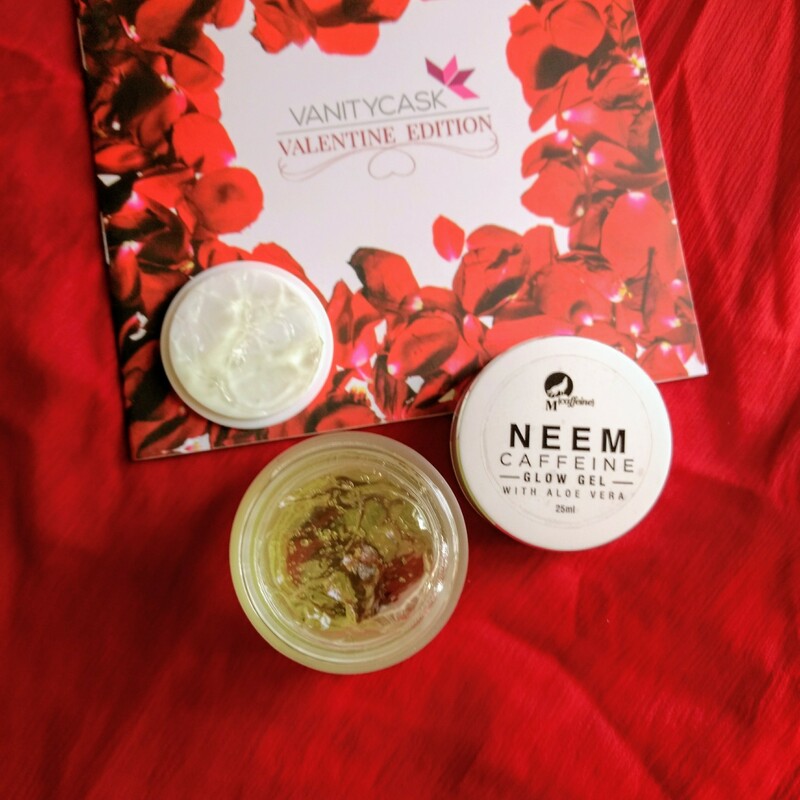 I liked all the products in Vanity Valentine Edition. Although I so feel one haircare product would have done more justice to the box that too from Votre. But VanityCask team has made up for it. You ask how? Each and every brand except Votre has some discounts to offer for with the validity till next month. I am extremely happy with this surprise with the box. It means if we like a particular product form above brands we can right away shop for it till next month. 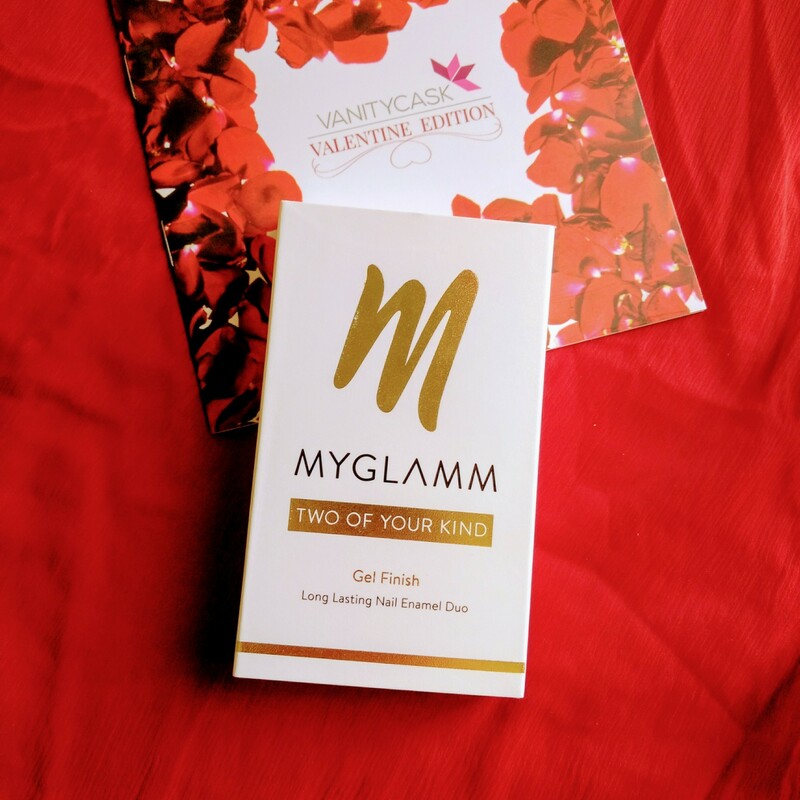 Plus we have two more vouchers to shop from Myglamm and Shae. All in all Vanity Valentine Edition is here to make your February even more loveable.